Crook, con artist and sexual predator attorney Willie Gary of Stuart, Florida, is scheduled to receive a "Spirit of Excellence Award" from the American Bar Association (ABA) on January 26th at the ABA's gala Mid-Year Meeting in Las Vegas. "This is outrageous and raises serious questions about the sanity, ethics and professionalism of those overseeing the awards and those leading the ABA," said Ray Rogers, director of New York City based Corporate Campaign, Inc., whose investigations into the Gary law firm have found what Mr. Rogers characterizes as "a decades long cesspool of unscrupulous behavior orchestrated by Mr. Gary." In a January 15, 2019 letter to Helen Kim, partner in Los Angeles based Thompson Coburn law firm and chair of the ABA's 12-member board of Commissioners overseeing the Spirit of Excellence Awards celebration, Mr. Rogers wrote: "Has anyone or group been assigned to investigate my charges that Mr. Gary is a crook, a con artist and a sexual predator and is not deserving of such an award? If not, I suggest they do so quickly and take appropriate action to prevent these awards from being questioned and tainted forever and to save the ABA from a lot of embarrassment." Mr. Rogers' letter to Ms. Kim was copied to ABA's leadership including ABA President Bob Carlson, ABA President-elect Judy Perry Martinez, ABA House of Delegates Chair William Bay and ABA Executive Director Jack Rives. So far, conversations with Ms. Kim and Jack Reeves chief of Staff Amy Eggert have apparently been ignored by the leadership of the ABA. Rogers adds, "If the ABA presents to Willie Gary the Spirit of Excellence Award, it makes a mockery of the legal profession and the ABA's slogan 'Defending Liberty and Pursuing Justice'"
The media can reach ABA Executive Director Jack Rives Chief of Staff Amy Eggert at 815-545-3771. This letter is a followup to our recent phone conversation with respect to your position as Chair of the Commission on Racial and Ethnic Diversity in the Profession for the American Bar Association. I haven't been contacted by anyone from the Association about my concerns over Willie E. Gary being one of four honorees listed to receive a Spirit of Excellence Award at the ABA Midyear Meeting in Las Vegas on January 26, 2019. Has anyone or group been assigned to investigate my charges that Mr. Gary is a crook, a con artist and a sexual predator and is not deserving of such an award? I hope your colleagues have thoroughly reviewed TheClientKiller.org website. If not, I suggest they do so quickly and take appropriate action to prevent these awards from being questioned and tainted forever and to save the ABA from a lot of embarrassment. Attorney Willie E. Gary ranks among the worst of what the legal profession has to offer. He is dishonest, immoral and a fraudster. Perhaps earlier in life he was decent and honest; that is no longer the case. Despite the slogan, "Trust The Team At The Willie Gary Law Firm," Gary and his law firm, over at least the past two decades, have been accused of defrauding numerous clients out of tens of millions of dollars and preventing justice for large numbers of victims of racial and gender discrimination, sexual molestation and other serious misconduct. 1. The documented information described in the flyer, "WARNING: PROTECT FLINT FROM FURTHER HARM. KEEP PREDATORS LIKE WILLIE GARY OUT OF TOWN! Attorney Willie Gary Will Promise You Billions, Only to Cheat You Out of Millions!" linked to below. 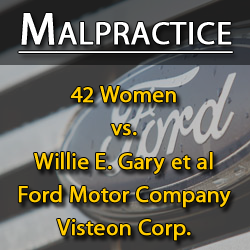 Forty-two Ford and Visteon employees sued Gary for stealing more than $51.5 million of their settlement money. Gary settled after the judge ruled against him. Leonard Rowe: "Attorney Gary has a pattern and practice of defrauding his own clients out of their settlements to enrich himself. 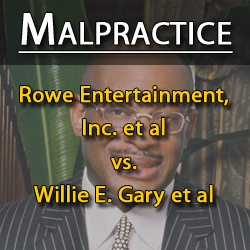 The question that keeps coming to my mind is why attorney Willie Gary is still allowed to practice law. He should have been disbarred and imprisoned years ago for the destruction of lives he has caused. Attorney Gary, in my opinion, is detrimental to the American public and a disgrace to the legal profession." Lead plaintiff and former president of the Black Promoters Association, Leonard Rowe, is only one of many cases handled by Gary where legal malpractice and colossal attorney misconduct seem to have been the norm. 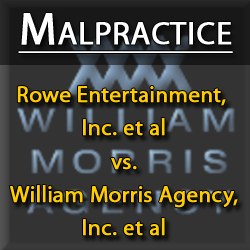 Rowe charges that, in his landmark civil rights case against entertainment industry giants William Morris Agency and Creative Artists Agency, Gary purposely threw his case aimed at protecting equal rights for large numbers of blacklisted African American workers. Despite hundreds of racially derogatory emails from employees of the defendants in the civil rights lawsuit, Gary allowed those emails to be returned to the defendants and never submitted them to the court. Gary then concealed his misconduct from Rowe by falsely accusing the judge presiding over the civil rights lawsuit as "racist." 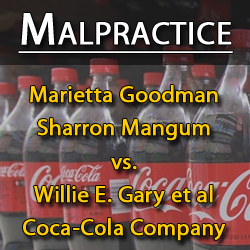 Sharron Mangum: "I wanted justice for the racial abuses I experienced at Coca-Cola's headquarters and Beverage Based Plant. Instead, I found myself fighting for my life. My attorney, Willie Gary, grabbed my breast, grabbed between my legs, forcibly placed my hand on his crouch and tried to force his tongue into my mouth. I fought back and reached for the door handle of the fast moving limo preparing to jump to safety. Willie Gary not only stole millions from me and others, he also threatened my life and sexually violated me." "Plaintiff Harsen immediately informed [Gary's colleague] Curt Rundell, who stated that, if Company A, Company B, or Willie Gary knew that Harsen had 'their case-closed files, with all that information, ...[Harsen] could find [her]self in a body bag.' After Harsen's husband asked Rundell what the $51.5 million was for upon handing Rundell the spreadsheet the following day, Rundell replied that 'the $51.5 million was money Willie was to receive from ...[Company B] for programs.' When questioned whether this was legal, Rundell stated that Willie is doing things that no other attorney has thought of doing and, believe me, he has himself covered." 5. Luisa Esposito: On December 26, 2015, Ms. Esposito a resident of Long Island, NY informed Mr. Gary and his colleagues that they were all being "fired for CAUSE for numerous reasons" including: falsely informing her just before a Mediation Settlement Conference that the primary defendant in her sexual molestation case, politically connected Wall Street attorney Allen Isaac, had been dismissed from her case; filing a "poorly written opposition on the eve of the due date" to the defendant's Motion for Summary Judgment to dismiss her case in its totality; giving defendants a copy of a confidential video produced by Gary's firm, documenting her case and revealing plaintiff team's strategy, without her consent; and failing to respond to her pleas to file a timely motion to reconsider a judge's ruling to dismiss her case. 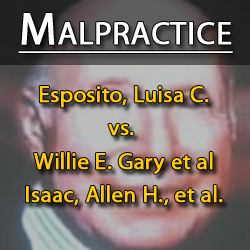 Ms. Esposito, who has engaged another attorney to appeal her case and attain justice, has nothing good to say about "The Willie Gary Team." 6. 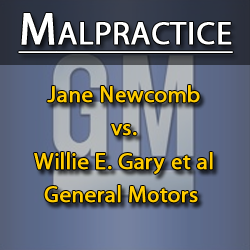 In Geneva Cook-Gervais vs. Gary filed on April 4, 2018, it was pointed out that "the Gary Firm has habitually missed court-imposed deadlines in tobacco cases for years, which has resulted in dismissal or unfavorable results" in at least six tobacco cases. "Even after federal and state judges have repeatedly chided the Gary Firm for its failure to abide by court deadlines and rules, the Firm has not taken any steps to protect its clients from this misconduct and gross negligence." "Willie Gary: Con Artist And Crook Par Excellence"
"Attorney Willie Gary: 'Giant Killer' or Client Killer? Please let me know whether the ABA is taking appropriate action by rescinding Willie Gary's invitation to receive a Spirit of Excellence Award, otherwise I will find it necessary to issue a national news release and reach out to a national network of groups concerned with such matters.